Nepal boasts 330 million gods and counting but none garners a more unusual collection of birthday well-wishers than Lord Shiva, the creator and the destroyer. In non- Hindu terms, Shiva is like the patron saint of Nepal. His spiky trident and his bull are ubiquitous from big city temples to impromptu shrines sprouting up in the middle of fields and roads. In fact, one of Hinduism’s holiest places, Pashupatinath, in the heart of Kathmandu, is one of the most renowned Shiva shrines as well as a UNESCO World Heritage Site. This year Shiva’s birthday fell on February 27. Maha ShivaRatri (Big Shiva Night) is a national holiday in Nepal. On the big day, thousands of devotees inched down the main road towards the main gate, tightly packed in a several kilometer-long snaking line waited to enter the holy room where they can worship the Shiva Lingam, a phallus symbolic of the regenerative power of nature. But some birthday guests had come many days before. 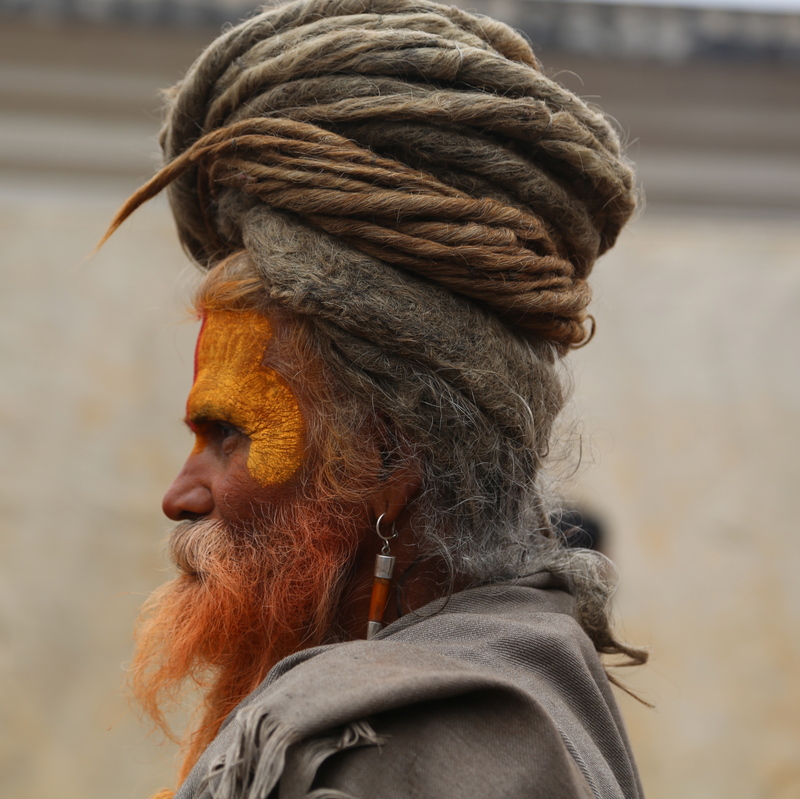 This year, more than 5,000 Sadhus or ascetic holy men who give up worldly possessions to achieve enlightenment, walked, biked and bused from far reaches of the Indian subcontinent and set up camp in every nook and cranny in the vast complex of Pashupatinath, making for a rather kooky birthday party. 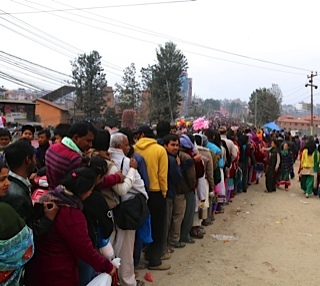 Most of eastern Kathmandu roads were closed to traffic to accommodate the crowds. The massive temple complex on the banks of the putrid but very holy Bagmati River was crammed with people. Tiny shack shops were doing brisk business, loudspeakers were blaring and thumping a Bollywood religious song. 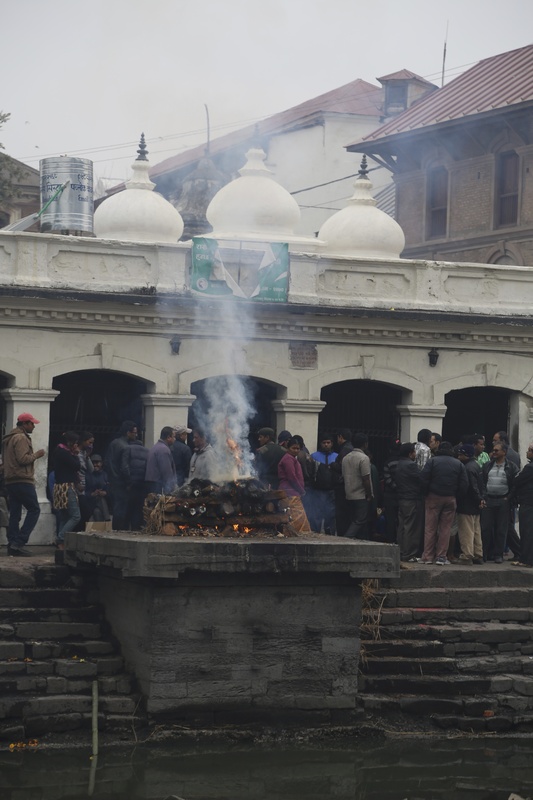 Pashupatinath is famous for its open-air cremations and the very distinctive both sweet and acrid smell of burning flesh and scented wood hit me even before I reached the three pyres that were brightly crackling, the smoke curling upwards into the grey sky. Amid the relatives of the dead squatting near holy men and asking for blessings, a young boy on very high stilts was entertaining a crowd of devotees. 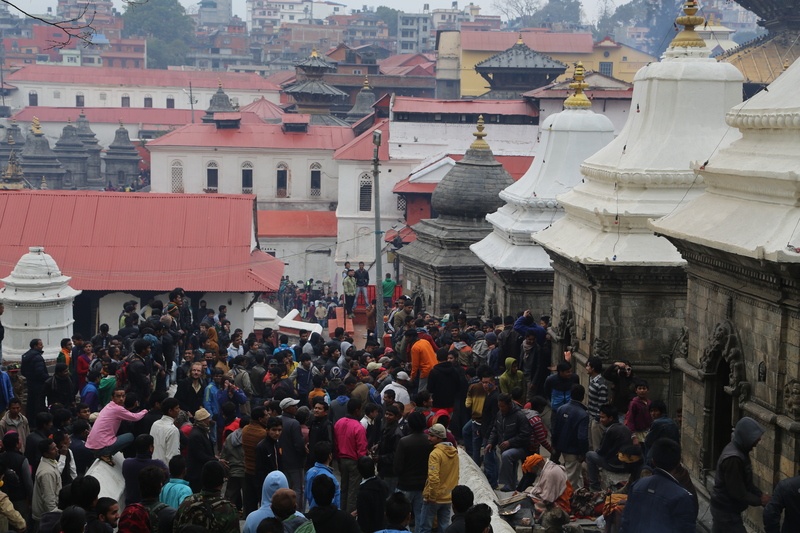 But this was not the scene that distinguishes Pashupatinath. On an upper terrace, in between several small temples laid out around a square were hundreds of saffron robed Sadhus, scores of devotees, some tourists and about a dozen police. Some Sadhus, called Naga Sadhus, were naked or almost so. Many were smeared in ash with massive dreadlocks piled on their heads, colorfully painted faces and long beards. One, with only a loincloth and a blanket, his eye rims bright red sat shivering and mumbling. In the chilly, drizzling morning, they shared home-made fires smoking more than burning on the stone pavement. The cremation scent quickly mixed with wafts of ganja (marijuana) that grew more and more intense as I walked deeper into the complex, stinging my eyes and coating my lungs. 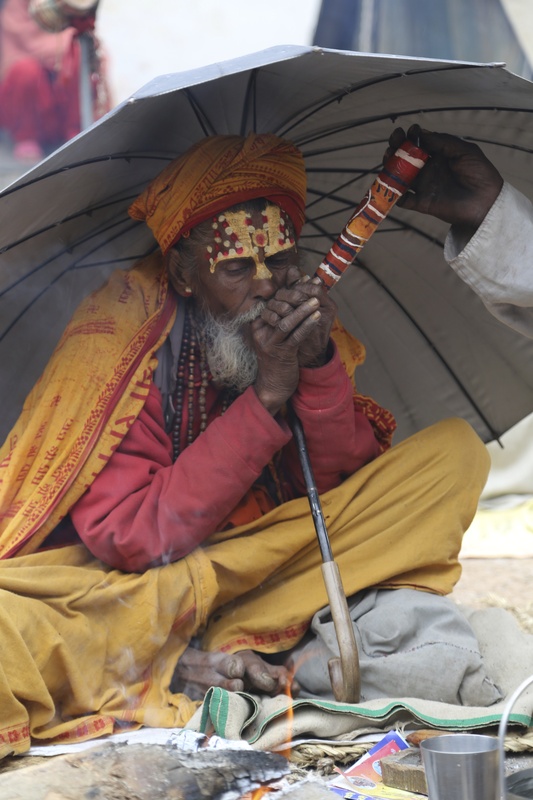 This year the police were not allowing the open sale of drugs but some of the Sadhus were doing a brisk business with young Nepali men as police looked on. While many devotees want to pay their respects to the Lingam, some do gather for blessings from these yogis who are thought to be very wise and gifted with special powers. Some Hindus consider them saints and the government of Nepal feeds and lodges them for their entire stay. The Pashupati Area Development Trust (PADT) estimates that about $14,000 will be spent on their room and board. The government also provides each one with a financial ‘gift’ when they leave. The yogis may have been saintly and one claimed he was 110 years old but a lot of their holiness and their weird charm was lost for me as I watched their aggressive demands for money from anyone who wanted to take their pictures. In fact picture-taking was a brisk business. They may claim to forgo all worldly possessions, but many had easily available change for big bills. I photographed one foreign tourist busy posing one Sadhu in a variety of different poses against a wall. No doubt for a hefty fee. Sadhus belong to different sects. 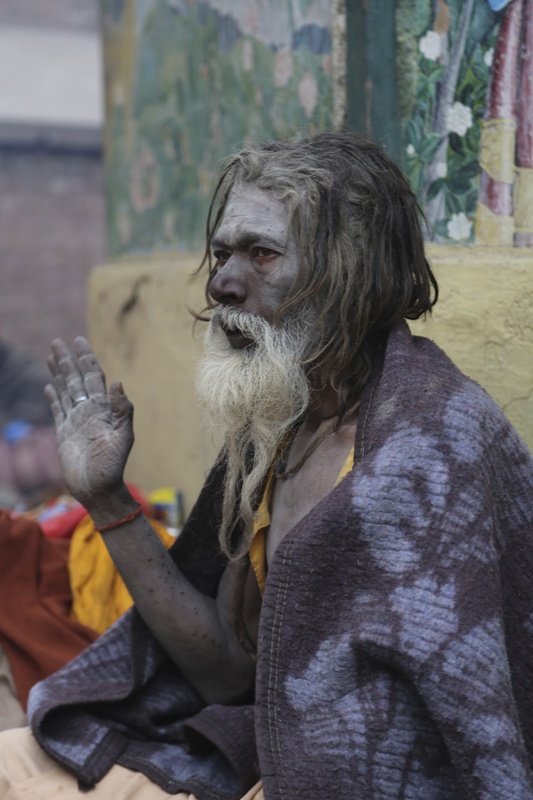 There was one much smaller group of Sadhus that were given a wide berth by their fellow ascetics and by the crowds. These men, dressed entirely in black, are Tantric or followers of the occult and worship Bhairav or Shiva’s fiercest manifestation. Some Hindus believe that they live near cremation grounds and feed off of human remains. When I saw them they were eating rice. Then of course, like at every huge party anywhere in the world, there are also the Birthday gate-crashers. Beware, not all Sadhus are real Sadhus. This entry was posted in asceticism, India, Kathmandu, living overseas, Nepal, religion, sadhus, Shiva, south asia, temple, tourism, Unesco, World Heritage site and tagged asceticism, birthdays, cremations, Donatella Lorch, gods, Hinduism, Kathmandu, Kathmandu Valley, living overseas, Nepal, Nepal news, religion, sadhus, shiva, shrine, south asia, tourism, World, world heritage site on February 28, 2014 by Donatella Lorch. I learned a new expression this week: Controlled Flight into Terrain or CFIT meant to describe a plane crash where a pilot unintentionally flies into the ground or a mountain. For anyone who flies around Nepal, this is a stark reminder of the risks. 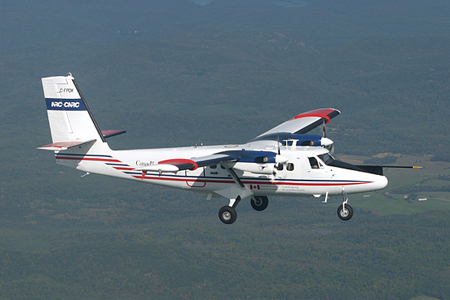 The day I read about CFIT on Twitter, a Nepal Airlines Canadian-built Twin Otter, the war horse of all planes, one of the few able to navigate Nepal’s uncompromising and unforgiving mountains and its short airstrips, crashed into a fog enshrouded mountain side, killing all 18 people on board. The flight bound for Jumla in the high Himalayas took off in dense fog and then asked to be rerouted before contact broke. Traveling around Nepal is surreally beautiful but far from simple. 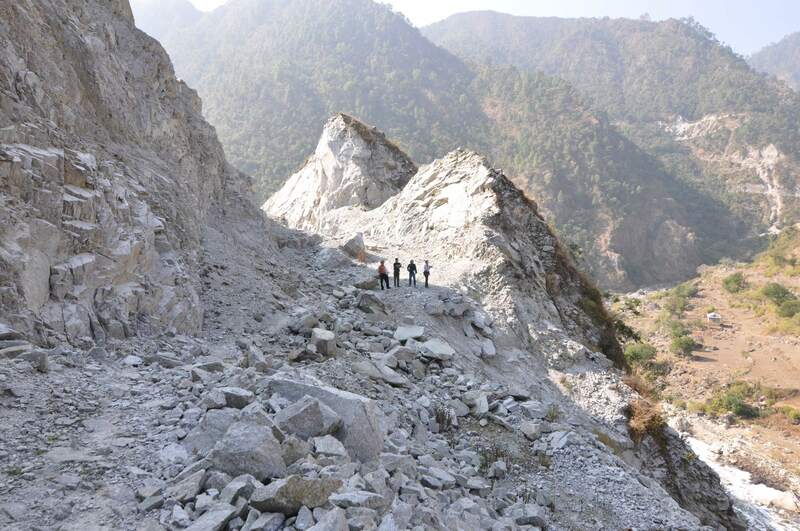 There are few paved roads and the dirt ones, mostly carved out of perpendicular mountain sides next to 1000 meter plunges are listed on maps as “fair weather” which means they are impassable for four or more months during the monsoons or by the frequent landslide. Many of the remote and desperately poor communities are only easily reachable by plane and on dirt airstrips that require STOL or short take offs and landings. But snow, fog and rain make navigating mountains treacherous so much so that airports, including Kathmandu’s, regularly close down for hours. This is the land of the Twin Otter. Maybe this crash was an anomaly?. Kunda Dixit, a renowned journalist and flying aficionado burst my bubble. Sixteen of Nepal’s fleet of 25 Twin Otters have crashed. According to Dixit, Nepal Airlines has now lost 70 percent of its 12 Twin Otters to crashes and has only one still airworthy. Even more heart stopping, Dixit’s article in the Nepali Times pointed out that of all crashes since 1955, about 90 percent were due to CFIT. The reasons are multifaceted. Cut throat competition in the airline business and thin profit margins coupled with political and local corruption has decimated safety nets. The government, struggling after a decade of a vicious Maoist revolt, has shown itself too weak to implement reform in that sector. Many of the smaller planes, such as the one that just crashed, are not provided with weather radar or de-icing. Flying has become a booming business and some pilots are careless and not as well trained as the veterans. Flight dispatchers should also be held responsible but the biggest pressure is on the pilots to fly regardless of bad weather and cash incentives are given for successful landings at destination. Last year a plane crashed at Jomson, when the captain refused to heed instructions not to land in a tail wind. Late last year, the European Commission blacklisted all Nepali planes from European airspace. Some might think this move irrelevant since no Nepali airline flies that far. But more to the point, they advised Europeans not to fly in Nepal. We have also been advised not to fly on any plane except for Buddha Air which has my eight-year-old son teasing me at take-off that this may be the fastest way to get to Nirvana. So what are people to do, stick to the roads? 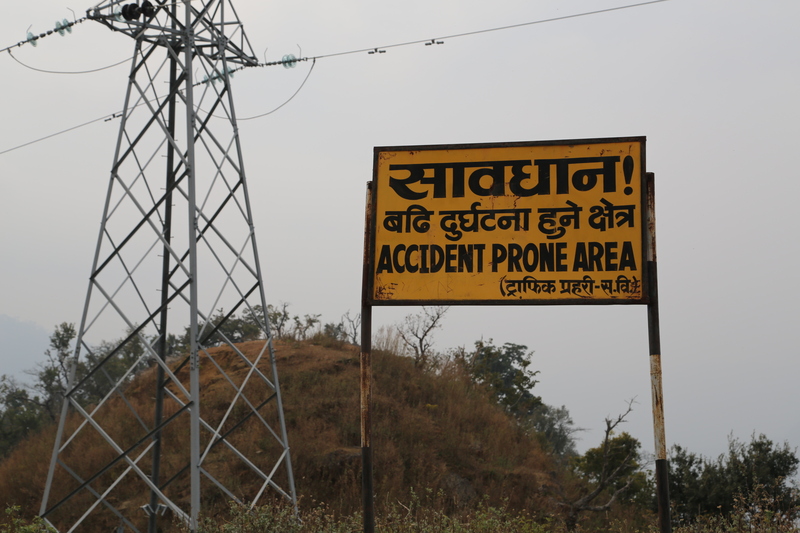 Nepal has one of the highest accident rates in the world. Despite a plethora of signs saying “Dead Slow”, “Sharp Bend,” “Push Horn” and “Accident Prone Area,” trucks, buses and taxi jeeps are overloaded, have non working signals, don’t use headlights and their drivers rarely slow down when they see you coming in the other direction on a road barely the width of a lane and a bit (with a precipice on one side). Truck windshields are an artistic collection of colored stickers, plastic multi-colored flowers, and religious paintings leaving two small slits through which to see the road. 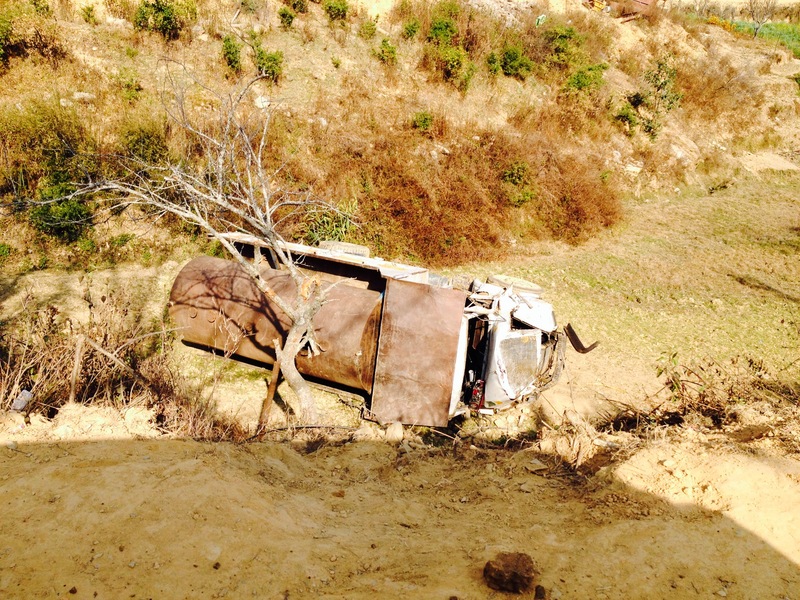 Breakdowns are marked by a few tree branches stuck in the back of the vehicle held immobile by a rock behind a wheel gathered from the nearby recent landslide. 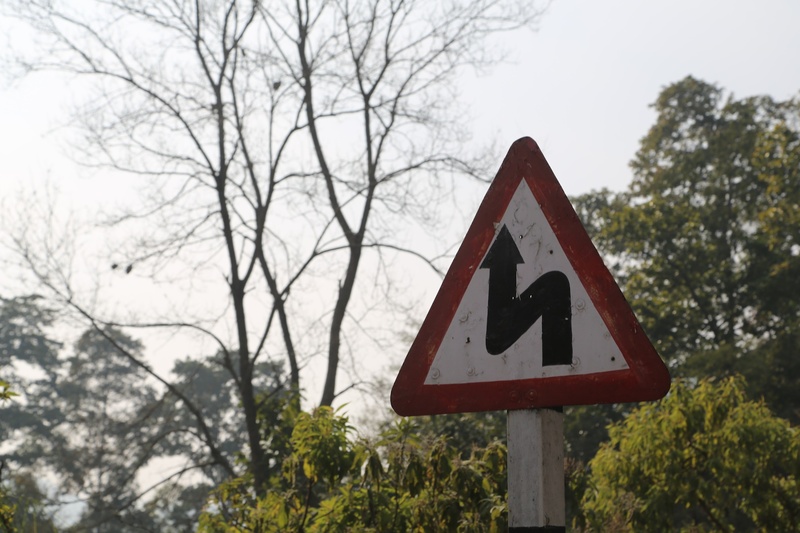 After driving 1000 kms from Kathmandu to Western Nepal, I quickly learned to give up my American road etiquette. Asking “how far” provides useless information. The key is “how long does it take to get there.” The only paved road snaking uphill almost 2000 meters into remote districts of western Nepal is a 134km stretch or a six-hour drive. It is marked by 18 roadside rock shrines, engraved with the date and location where a vehicle plunged into the abyss. It is so steep here, that the wreckage remains untouched. Even the country’s vast population of stray dogs participates in making driving challenging. They curl up and sleep in the middle of the road and like everyone else on the road, they do not give way. In fact, they don’t even wake up. My Nepali friends shrug their shoulders at the dangers. It all boils down to Karma, they say. If it is your time, it is your time. I have yet to reach that zen acceptance. I thought I’d alternate risk. 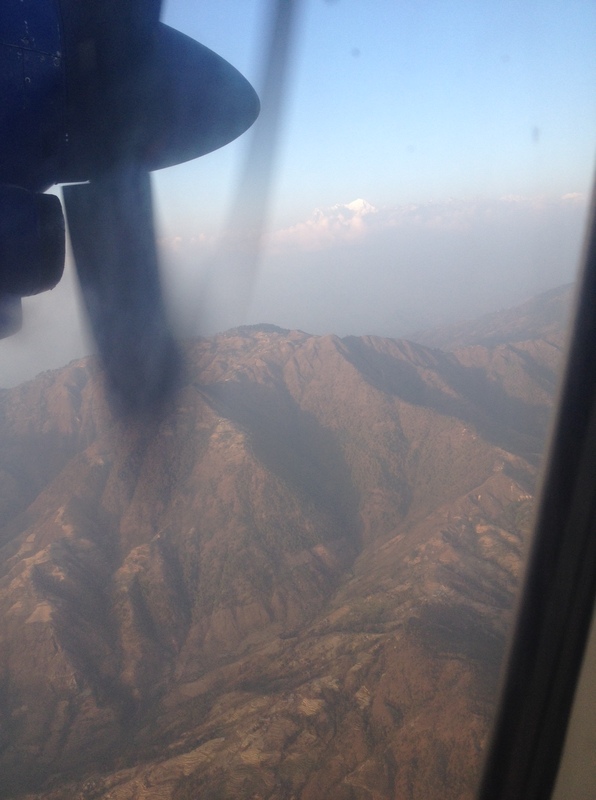 I flew back to Kathmandu on Buddha Air. This entry was posted in airplane crashes, Buddha, hinduism, Kathmandu, living overseas, Nepal, religion, road construction, roads, south asia, tourism, transportation, trekking, twin otter, wilderness and tagged airplanes, Donatella Lorch, emergency preparedness, Kathmandu, Kathmandu Valley, living overseas, Nepal news, plane crashes, road accidents, road signs, south asia, tourism, transportation, twin otters, World, world heritage site on February 25, 2014 by Donatella Lorch. 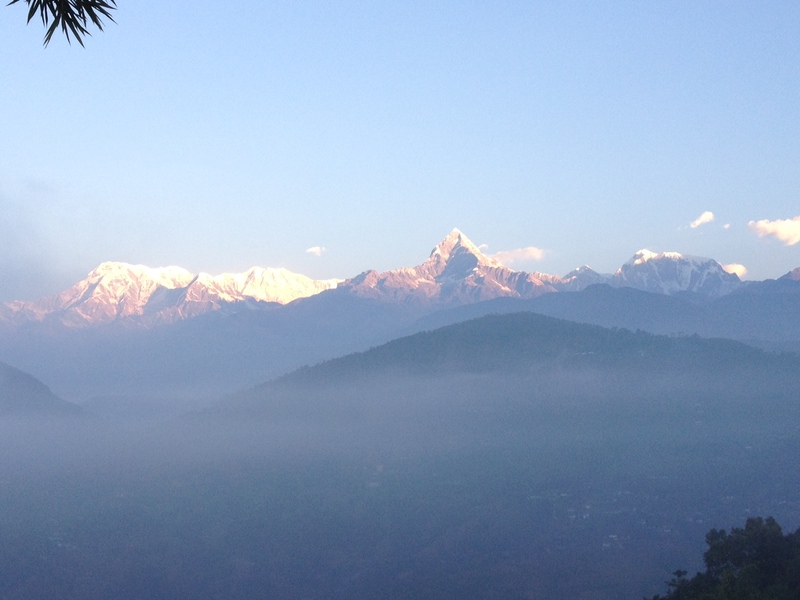 As any tour company will tell you, Nepal is the land of the Gods. It is the birthplace of Buddha and home to a vast pantheon of Hindu deities. The power of these gods is taken seriously. Even the secular government has decreed that certain sacred peaks cannot be summited as that might anger the god who lives there. Yet dumping garbage in the country’s national parks and in the conservancy areas apparently does not bother these divine beings. Nepal’s holiest River, the Bagmati that flows into the Ganges, is fetid and dead. Garbage and in particular plastics, are not only a health hazard but fast becoming the biggest threat to future tourism in this country. 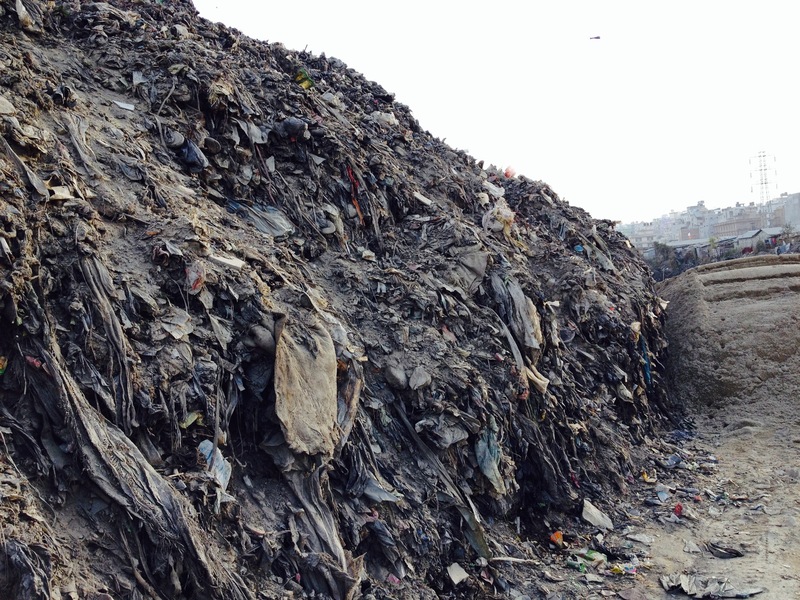 Waste management is a critical problem throughout Nepal especially in the Kathmandu Valley with its booming population, polluted rivers and lack of a system to dispose of non- biodegradable garbage. But Edou says cleaning the mountains first can set an example and build a system for cleaning up the entire country. A plastic water bottle takes 450 years while a plastic bag takes 100 years to decompose. Local mountain communities have tried on their own to ban plastics but the government’s lack of policy and legislation make it a sisyphian struggle. In Chhomrung, in the Annapurna Sanctuary, one of Nepal’s most visited trekking areas, Hem Bahadur, a lodge owner, followed by a dozen others, banned plastic bottles 13 years ago. 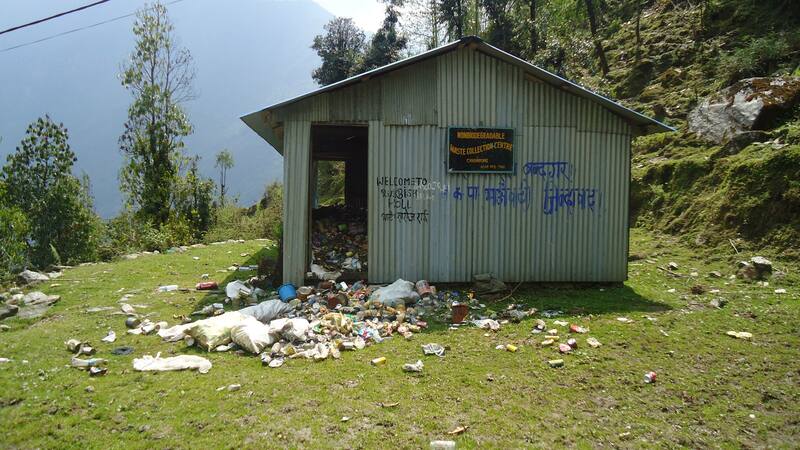 But how can villages of a few dozen households deal on their own with the garbage detritus of tens of thousands of trekkers and religious pilgrims? There is no ability to reuse or recycle plastics in the mountains. It is dumped in makeshift sites or burned, releasing dioxin, a carcinogen. Lo Manthang, a stunning medieval village, is the capital of Upper Mustang District, and has been proposed by the Nepal government as a UNESCO World Heritage Site. In 1992, when Upper Mustang opened up to tourists, plastic bags and bottles were removed from trekker bags at checkpoints. 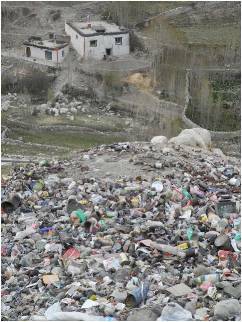 But the Maoist insurgency and lack of government leadership, stalled the anti-plastic movement. Until recently, the garbage of tens of thousands of tourists was just piled up on the town’s outskirts. The town understood that it was an eyesore and moved it one kilometer away from the main tourist route. Out of sight. Out of mind. “It could be so simple,” Edou stressed. “Just don’t buy plastic bottles along the way. Use filtered water.” For Edou, there is only one solution in the mountains: a ban on all plastic bags and bottles. But to do this successfully, the government must promote clean environment in schools, encourage local businesses to produce alternatives and above all require lodges to provide filtered water. There must be a code of conduct for trekkers. In Nepal, the mountains are a symbol of national pride. Thirty years ago, the mountains were all plastic free. Critics insist there is a lack of political will. Plastic bags are made in Nepal. And plastic bottles are a booming business here as well. In Nepal, much of everyday life is about access to clean water. Municipal water supplies are inconsistent and unreliable. The history of bottled water in Nepal dates back to 1992 when there was only one brand on the market. There are over 55 now but studies and testing of water quality show that more than 50 percent of mineral water brands do not match World Heath Organization drinking water standards. The simplest and less expensive alternative, says Edou, is an EPA-approved gravity filter that is already used in some villages. To change a way of life is always difficult. But the alternative spells ecological disaster. This entry was posted in beauty, Buddha, garbage, hinduism, India, Kathmandu, living overseas, national parks, Nepal, religion, south asia, temple, tourism, trekking, Unesco, waste management, wilderness, World Heritage site and tagged annapurna, Buddhism, Donatella Lorch, garbage, gods, himalayas, Hinduism, Kathmandu, Kathmandu Valley, living overseas, nature, Nepal, plastic bottles, plastics, religion, shrine, south asia, tourism, trekking, waste management, World, world heritage site on February 11, 2014 by Donatella Lorch. Just 25km south of Nepal’s capital as the crow flies, the limpid Kulekhani River empties into the larger and heavily polluted Bagmati River, which flows in a series of twisting bends down from Kathmandu. In this narrow gorge bordered by steep treeless mountains that slice the blue sky, there are only a few mud houses perched on seemingly inaccessible ledges and on the riverside an army camp of plastic-covered quantum huts. This is the shortest way from Kathmandu to the Indian border. To get here from Kathmandu, I took the shortest route passable by a 4X4 car – a 45km drive that took 2.5 hours on a narrow mostly-dirt road that hairpins over sheer precipices. 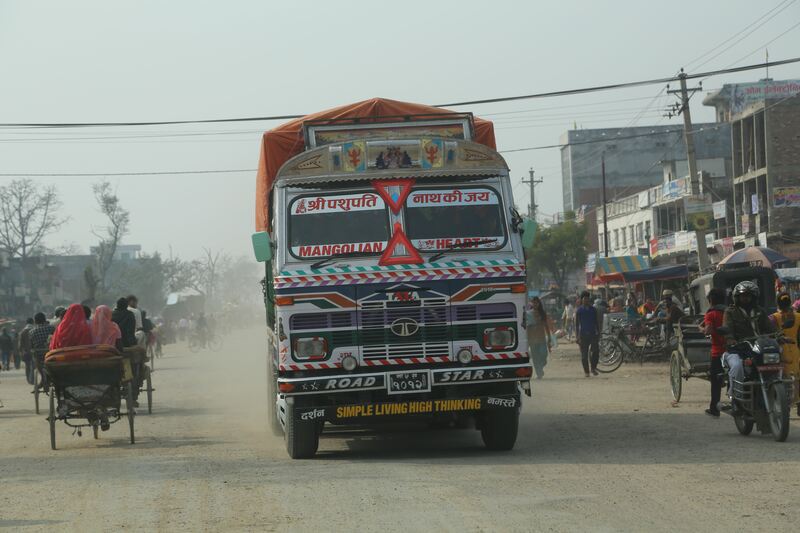 The road is too narrow for the trucks that bring fuel, propane and all imported goods from India to the Kathmandu Valley. They have to take a 152km detour that on a map looks like a big C loop. 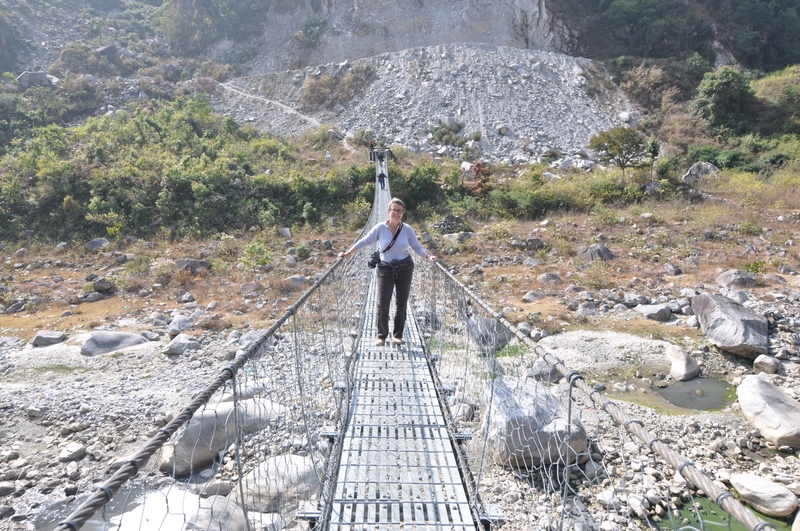 Inaccessibility is a defining characteristic of Nepal’s history. Much of Nepal is an endless sequence of steep hills and narrow gorges that abut the world’s highest mountains. Once you leave the Indian border and the Terai, the word flat or straight is rarely used to describe a road (outside the Kathmandu Valley). Whole areas have been so geographically isolated that Nepal, a country of 27 million, has 123 spoken languages and 125 ethnic groups. 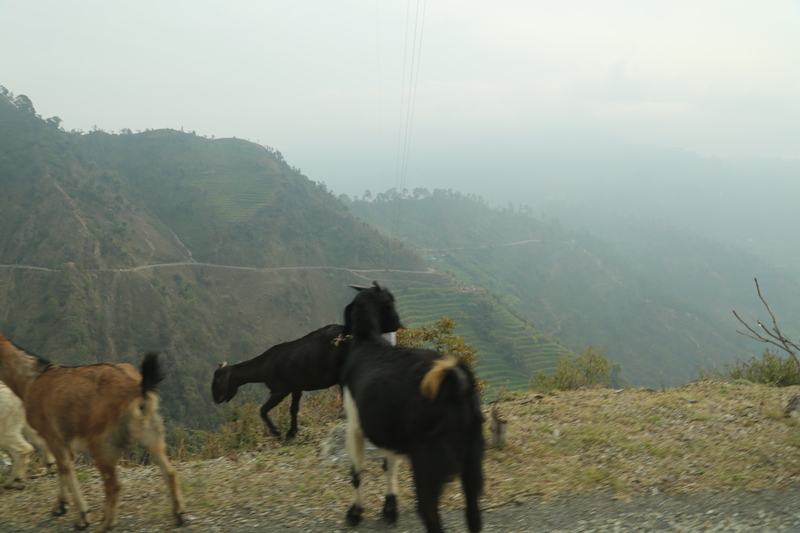 Today there are still far-flung areas of Nepal, especially in the northwest, that are not connected by any road and where all goods have to be brought in on foot or by donkey. After years of a violent Maoist revolt that tore Nepal apart, roads are a critical means of integrating and uniting a nation. Not only do roads facilitate trade and decrease poverty but they also provide isolated areas with security and medical care. 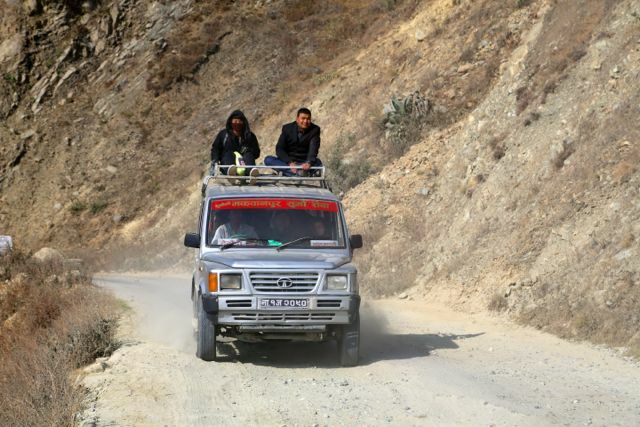 Most of Nepal’s roads are not paved and even on the paved ones, the maintenance is poor and irregular. Landslides are commonplace, especially during the torrential monsoon downpours. Vehicles, often overloaded, have frequent accidents. Only Peru ranks up there with Nepal as the toughest country in the world to build roads. 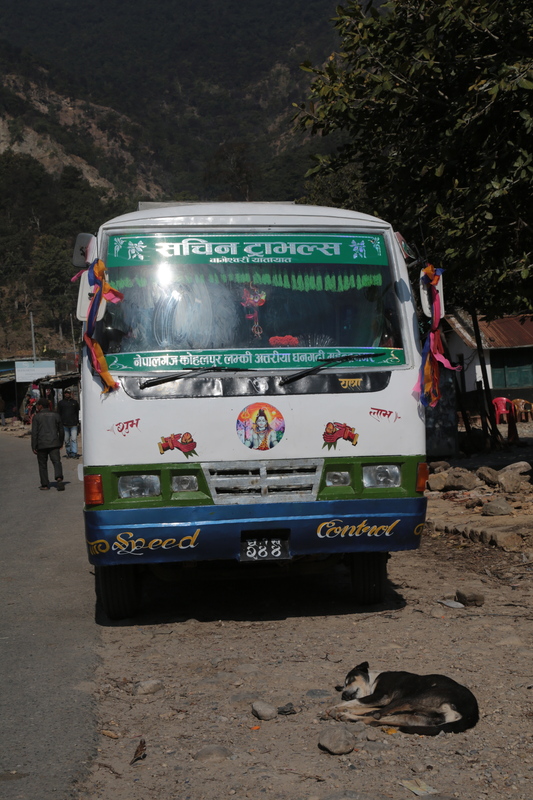 Today, the fastest way from Kathmandu to India is through the town of Hetauda on the dirt road I took. The main means of transport is the Tata Sumo, a 4X4 large jeep lookalike. A Sumo can cram 12 to 15 people inside and at least five sitting on the roof rack. Up to 800 Sumos a day aggressively ply this road that at one point curls up the sides of mountains and has redefined for me the meaning of the word ‘narrow’. The road has no shoulders. From the open window of our car, it is possible to touch the sheer wall of rock, on the other side our wheels are inches from a sheer drop of at least 400 meters. Below and across the river gorge, houses inch up the hills while white Buddhist stupas and Hindu temples perch on hilltops accessible only by switchback dirt trails that resemble goat tracks. Reverse is often the only way to deal with oncoming traffic. It takes five hours to the Indian border. Trucks take the longer 10-hour route. The Nepali government has a four-year-plan. 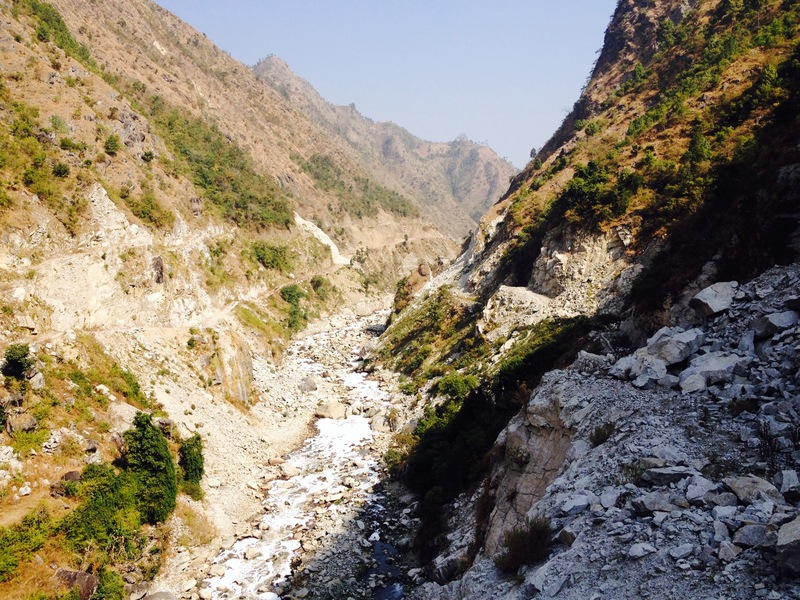 They want to build what they call a “Fast Track” road following the Bagmati River to India. This 91km-road would link Kathmandu with a new airport the government wants to build in the flat Terai land for bigger airplanes. The new airstrip is to be built in one of Nepal’s foggiest zones. Critics say this will affect airplane traffic. 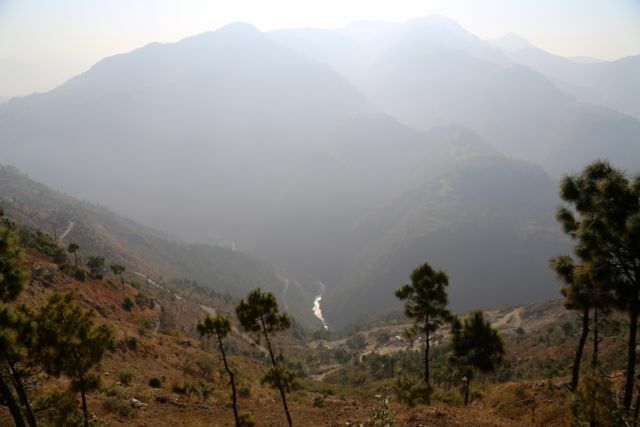 Tourists would then take the two-hour drive to the Kathmandu Valley. Of course the airport won’t work if the road isn’t there. Challenges to building the ‘Fast Track’ are technical, financial and political. In the road sector, politicians often pressure the government to steer projects to their home districts. In one district in Nepal, the conflict between three political parties over the building of one bridge compelled the government to agree to build three bridges (one for each party) within 4kms of each other, but to date, no bridge has been completed as the project has become too expensive.Six months ago, at the confluence of the Bagmati and Kulekhani, the Nepali army enthusiastically blasted a segment of the ‘Fast Track’ through an overhanging mountain crag transforming it into a jumbled pile of jagged white boulders. Since then the work has stalled. Financing has yet to come through. International engineers estimate a cost of about US$1billion, 40 percent of which would go to building 9kms of bridges and 1.4kms of tunnel. 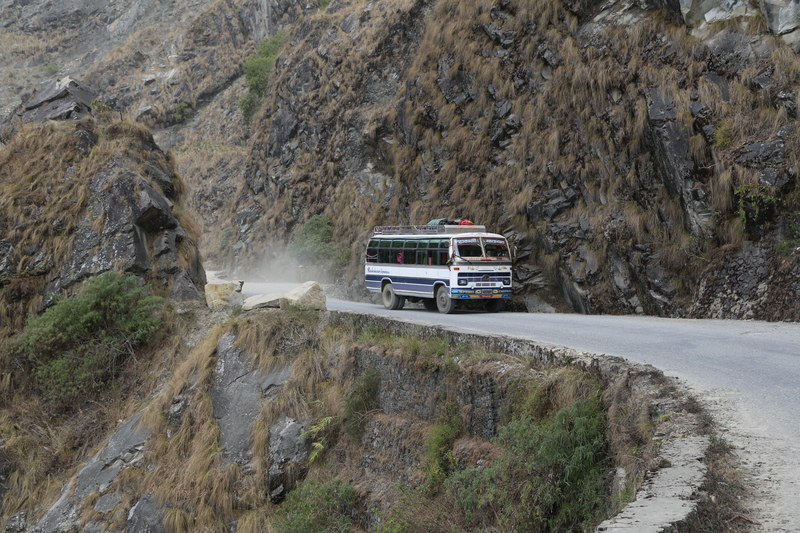 Geologically, mountains are unstable in Nepal and no road tunnel has ever been built here. The ‘Fast Track’ will exist though it probably will take 10 to 20 years. 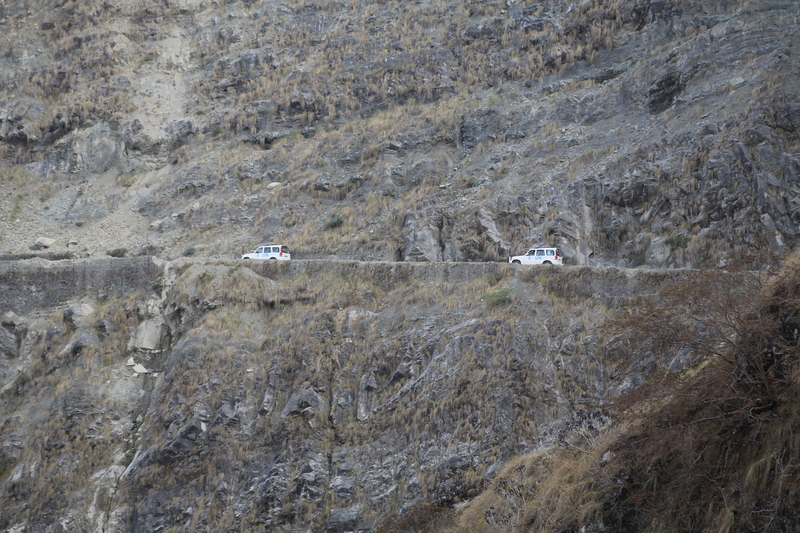 In the meantime, we continue to drive on our goat-like mountain paths with the nail-biting hairpin turns, incredible scenery, on Nepali time and dreaming of better roads. This entry was posted in India, Kathmandu, living overseas, Nepal, road construction, south asia, stupa, temple and tagged border, bridge construction, Donatella Lorch, engineering, India, international assistance, Kathmandu, Kathmandu Valley, landslides, living overseas, nature, Nepal, Nepal news, road accidents, road construction, road maintenance, roads, shrine, south asia, Terai, transportation, World on February 5, 2014 by Donatella Lorch.